I love La Ginestraia’s Pigato. It goes everywhere with me. With seafood, with Asian cuisines, with lighter pasta dishes, with cured meats. I was hoping they would make it so I could fit a bottle on the end of my keychain but the winery hasn’t returned any of my calls on that one. In the meantime, I’ll have to be content with enjoying this perfectly white wine the traditional way, from the fridge, with a corkscrew and a glass. 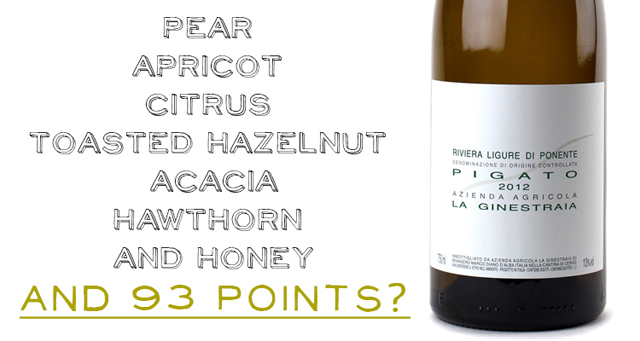 La Ginestraia’s 2012 Pigato is, to me, about as perfect as white wine gets. Not because it’s the biggest (there’s bigger) or the nerviest (there’s nervier). No, to me it’s the perfect white wine because it stylistically pushes all my white wine buttons. Its unoaked, preserving the unique character of the Ligurian hills where it’s grown. The vineyards are close to the sea, infusing it with this wonderful briny quality that is a compete mash-up with all of the ‘typical’ Pigato notes of pear, apricot, citrus, toasted hazelnut, acacia, hawthorn and honey. All stuff I like in my whites! The La Ginestraia winery is located in the heart of Liguria, and many of the winery’s vineyards are at elevation with a fine view of the water. Proprietor Marco Brangero’s winemaking is pretty straight-forward seen as, with grapes like these, there aren’t a lot of bells and whistles that need to be added. You simply let nature do its thing. We should also extend a note of congratulations to Marco as this wine just picked up a monster 93 point score from Mr. James Suckling the other day, Suckling calling it“flavorful and wonderful”. If I’m Marco I’m taking that and running with it, heckuva score for a $20 white wine.